WHITNEY is a premier pick of MacDonald Ranches 2009 heifer calves from the standpoint of performance, pedigree and phenotype. 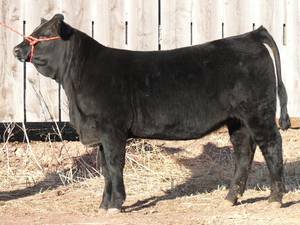 She is sired by MAC TOPEKA 159T, the $20,000 top-selling bull of MacDonald Ranches 2008 sale. Her dam, MAC MARLENE 39M, is a feminine, attractive and very nice-uddered daughter of BEV Masterpiece who has an impressive production record. Her first calf was MAC PARATROOPER 1P, herdsire for both MacDonald Ranches and Southern Eagle Ranch of Evington, VA. Her second calf was MAC RICHLAND 211R, herdsire for RAO Salers of Williston, ND and sire of the 2nd high selling bull of the 2008 Midland Bull Test. Her third calf is MAC SHARLENE 300S, dam of MAC ULTRARED 262U, the top-selling bull of MacDonald Ranches 2009 sale. Best of all, WHITNEY has the thick-made, high-volume, high-performance phenotype that one would expect of her pedigree and tops it off with a great disposition. She is DNA-tested homozygous black.